Quietly standing in the landscape of the Kay Jewelers Pavilion will be a family of sculptures without a name but not without purpose. Local artist, Don Drumm, is donating 3 free-standing sculptures to adorn the grounds of the building. Although Drumm didn’t design the sculptures specifically for the hospital, the pieces are a beautiful reflection of the families it serves. 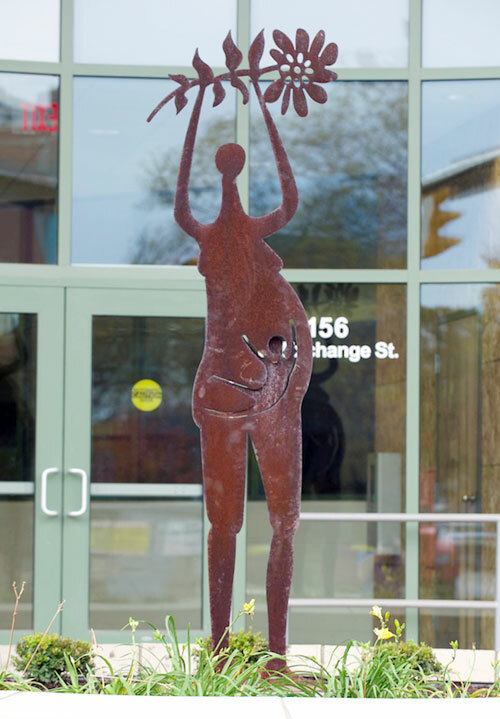 After hearing about the newest building on Akron Children’s campus and seeing its construction, Drumm felt the sculptures were best suited just down the road from his gallery. While Drumm is widely recognized for his use of cast aluminum as an artistic medium, the family sculptures were created with an equally unique technique but different material. Drumm designed the sculptures as hand-drawn sketches and used a computer-assisted water-jet plasma-cutting machine to make them come to life. One sculpture, depicting a pregnant mother, is made of Core 10. This special steel, made by U.S. Steel, holds rust to give a rusty finish and color but doesn’t decay. parents with children, were made from mild steel then galvanized with zinc and sand blasted. Ink color and sealer were also added to the surface to suit the artist’s preference. Through this layering process, the integrity of each sculpture can endure the extreme outdoor temperatures and weather conditions. The material, color scheme and images portrayed in Drumm’s sculptures are echoed in the design and color selection used inside the new building. 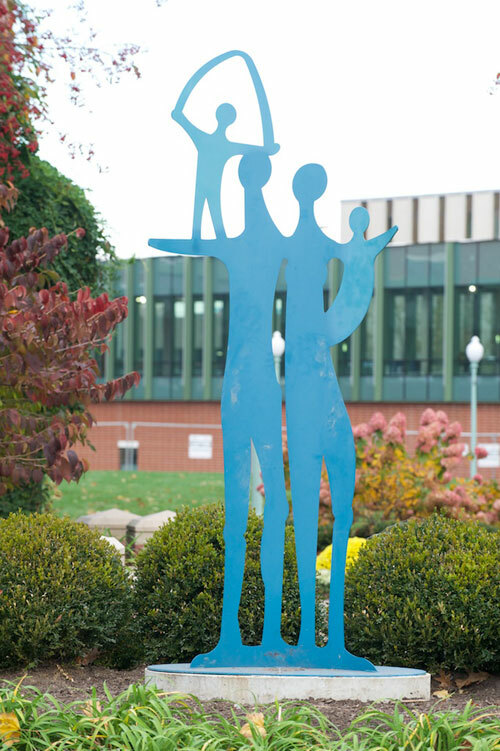 For example, the emergency department, which represents a puddle, uses cool, calming colors similar to the blue color of the family sculpture. The outpatient surgery center, which represents a sandbox, uses a warm yet lively interior color palette much like the pregnant mother sculpture. The blue family sculptures are located in each landscape bed on the southeast and southwest corners of Perkins Park. The rust-colored mother sculpture is featured in the landscape bed in front of the Exchange Street Deck. “I think Children’s is the perfect home for these sculptures,” added Lisa Drumm, Drumm’s wife and fellow artist.